Sorry I’ve been MIA. 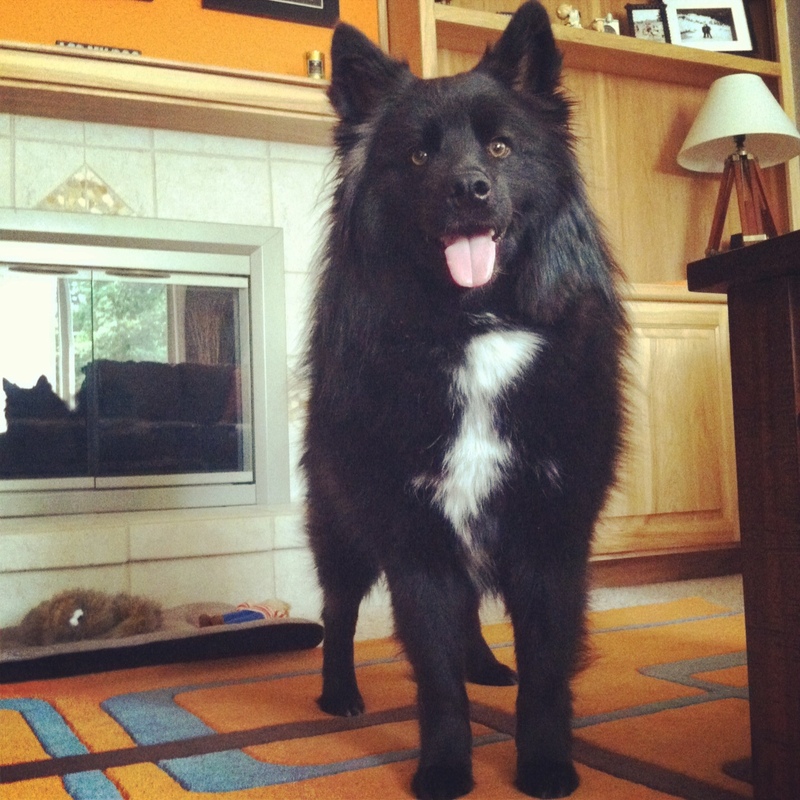 These past few days I’ve been having the worst luck with the ‘ol blog. Either my computer is acting up, the Internet is down, or a combination of both. Grrr…. Hopefully I’ll get it all figured out because I have some pretty cool reviews coming down the pike that you won’t want to miss. Today’s review is on babyhoot’s treat bag. 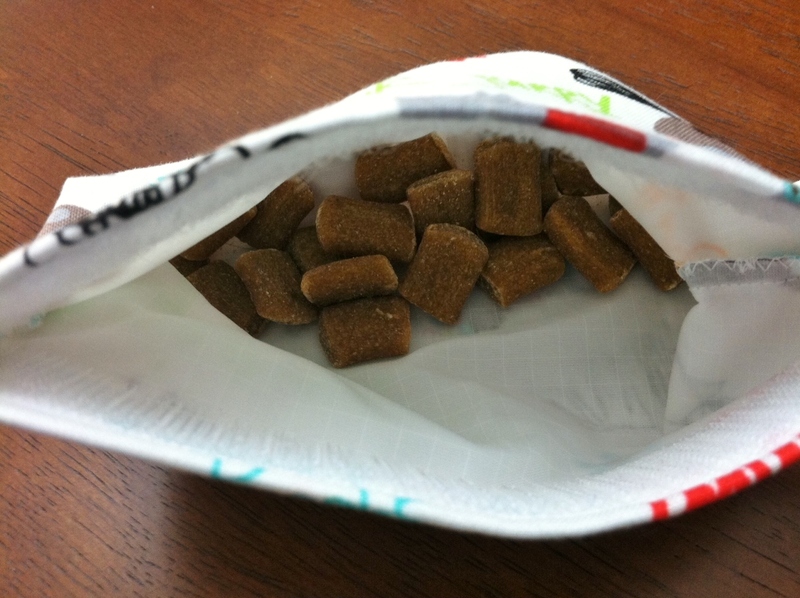 I was totally excited when Christina, the owner of babyhoot, contacted me to see if I’d like to do a review of their treat bag for Her Dog Blog. Babyhoot makes a line of quality handmade goodies for babies ranging from burpcloths to hair clips. 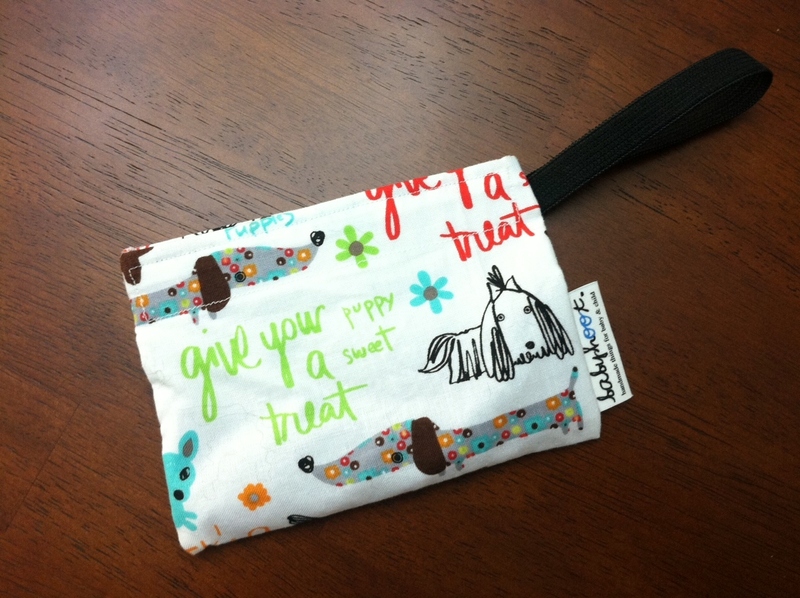 This treat bag can also be used as a snack bag for both kids and adults or as a carrier for poop bags, your cell phone, extra cash, etc. How cute is the print?! Once I got this adorable little thing in the mail, I threw some treats in it (the treats pictured are My Mighty Wolf Turkey Bliss Recipe) and took Teton for a walk. 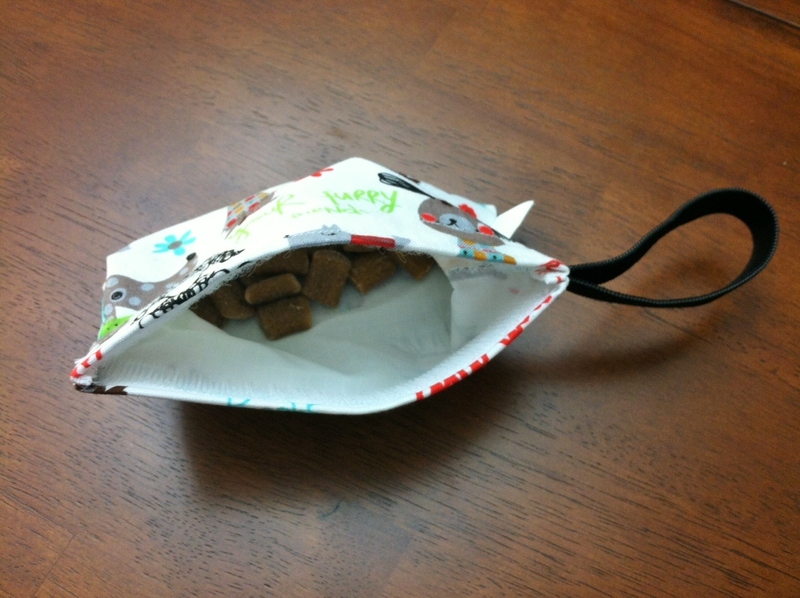 The treat bag small enough to not be cumbersome around your wrist or looped through the leash but big enough to hold quite a few treats. One thing that I really appreciate about it is that it has an inner liner in case you choose to put a particularly juicy or greasy type of treat in it. 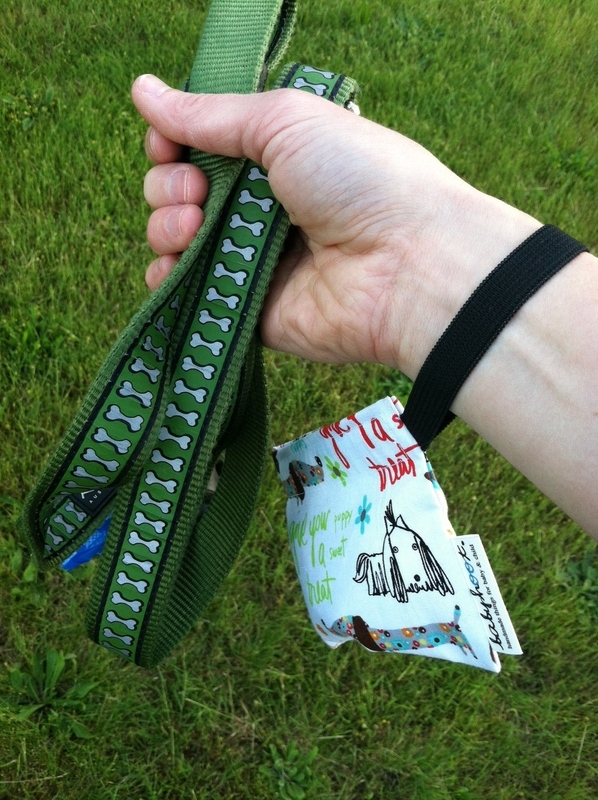 Rather than loop the elastic band around the leash, I chose to hang it from my wrist. Normally I wouldn’t like something dangling as I walk, but I really didn’t mind it at all. The elastic fit perfectly (not too snug but not too loose, either) and I honestly forgot that the treat bag was even hanging there. While walking, the treat bag was easy to open and just like the babyhoot page says, Teton quickly understood that when the Velcro opened up it meant he was going to get a treat. I really like this treat bag for it’s simplicity and quality. The fact that the print is adorable is an added bonus! Want another bonus? It’s only $4.00! Head over to the babyhoot Etsy page and peruse the cute assortment of goodies for babies, kids, and dogs. Posted on June 7, 2013 by Shannon	This entry was posted in This 'N' That, Treat Jar. Bookmark the permalink.